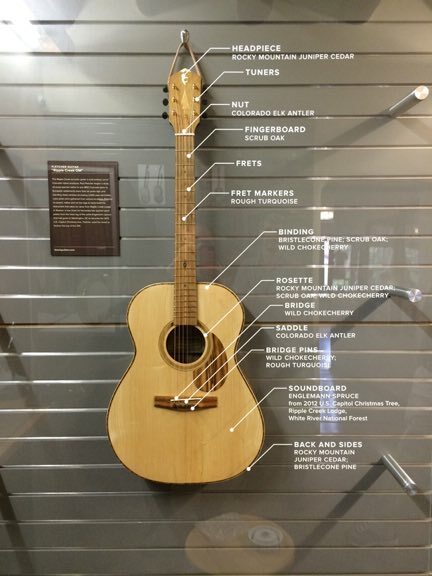 The art of stringed instrument restoration, repair, and building. Larry Pogreba doesn’t do many custom orders, preferring to offer his experiments for sale. His original instruments look and sound like nothing else. His flamboyantly welded aluminum body resonators—lightweight, with the cone cover of vintage auto hubcaps—have been coveted by Bonnie Raitt, Keb’ Mo’, Jackson Browne, David Lindley, Darrell Scott and many other top players. As a fine-arts student in the late 1960s, Pogreba built guitars as a hobby and shifted into making knives. He got back into guitar building full-time in the early 1990s, creating nearly 300 guitars. Most of his wood was salvaged in Central America from stumps and tops left by loggers or fire- and hurricane-damaged trees. Whimsy comes standard with every Pogreba instrument and defines his many other inventions, such as a long-range cannon that fired bowling balls that he developed while sequestered in Colorado. The Ripple Creek acoustic guitar is built entirely out of Colorado native products. Paul Fletcher began a study of wood species native to pre-1850 Colorado (prior to European settlement) more than six years ago and standing dead varieties (including 2,000-year-old bristlecone pine) were gathered from various locations. Fletcher re-sawed milled and cut the logs to hand-build the instrument that takes its name from Ripple Creek Lodge in Meeker. It was there he harvested two quarter-sawn plates from the base log of the same Englemann spruce that had gone to Washington, DC to become the 2012 U.S. Capitol Christmas tree. Fletcher used the wood to fashion the top of the OM. 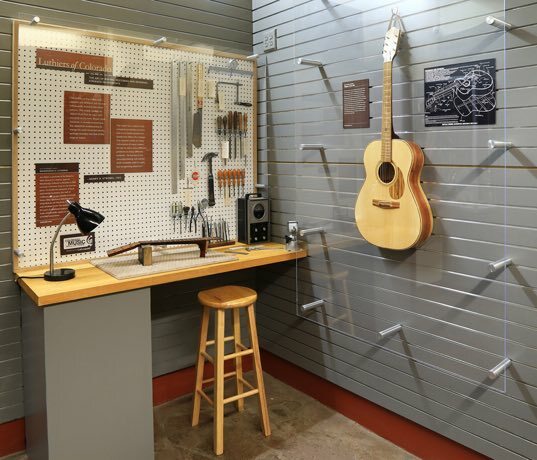 An Arvada High School graduate (class of 1961), Denny Stevens began building guitars during his teenage years. Preferring to have his referrals generated by word-of-mouth rather than self-promotion, he apologetically declined interview requests and turned away apprenticeships. He designed and built custom instruments for his clients, his waiting list sometimes exceeding five years. Stevens specialized in arch top instruments and made flat top guitars as well. In 1991, he designed and built the double-neck 14-string guitar dubbed a “guitjo.” Stevens’ life was cut short by ALS in 2009. Nederland artist Max Krimmel’s career as an instrument builder began circa 1965 with a Denver Folklore Center course in guitar making (“Build Your Own Peach Box Guitar”). He built 169 instruments between 1965 and 1982, bought by such clients as Jerry Jeff Walker, Stephen Stills, David Bromberg, the Kingston Trio’s Bob Shane and Colorado favorites Judy Roderick, Carla Sciaky, Mary Flower, Chuck Pyle and Krimmel’s partner Bonnie Carol. Jazz guitarist Al Di Meola and the group Supertramp used Krimmel guitars on albums recorded at Caribou Ranch. Made in 1980, “#150” has the full “Style 45” treatment (the top of the Martin line), distinguished by abalone shell and mother-of-pearl inlay everywhere and a bridge constructed of solid ivory. The sides and back are Brazilian rosewood; the top is German spruce. Harry Fleishman has built unique custom guitars since 1973, when he established Fleishman Instruments in Denver, and then Boulder, Colorado. His research and experiments in asymmetric design, multi-soundport and multi-tonewood instruments, as well as electric upright basses, have influenced many craftsmen. Fleishman is active on many professional fronts. He teaches focused workshops at Luthiers School International and formerly directed the American School of Lutherie. He has pioneered designs of guitars and basses for leading guitar companies in the U.S. and internationally. Founded in Longmont, Colorado by craftsmen Monty Novotny, Reb Bennett and Bernie Nettesheim, NBN built custom guitars from 1969 to 1976 for such notables as James Taylor, Leo Kottke, Stephen Stills, Peter Yarrow, Paul Simon and the members of the Colorado band Magic Music. The NBN “R-2,” made in 1971, was one of three instruments fashioned for Chris Daniels. NBN’s basic steel string guitar line consisted of three grades of ornamentation; the second style was offered in rosewood (as well as mahogany), hence the model name. A lifelong scientist, teacher and student of wood, Michael Bashkin mastered the substance during his graduate studies in forestry at Colorado State University, his post-graduate research at Duke University and his subsequent years teaching tropical forestry in Belize. In 1996, he opened Bashkin Guitars in Fort Collins, Colorado. Working with exotic woods and a unique set of guitar designs that he has developed, he builds acoustic instruments for guitar players throughout the U.S. and around the world. The 2015 OM model has a Carpathian spruce top and Indian rosewood back and side. 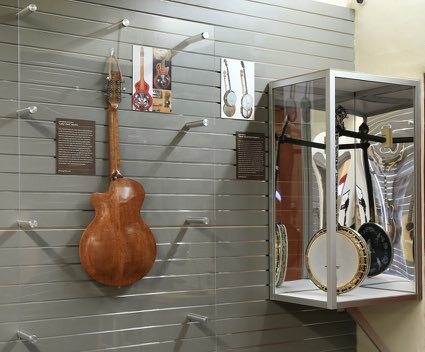 Chuck Ogsbury came to the art and craft of lutherie in 1960 as an engineering student at the University of Colorado, sand-casting aluminum banjo rims to produce the first 100 ODE long neck banjos in his parents’ Boulder garage. By 1965 he had produced over 2,000 ODE banjos, ranging from basic aluminum pot long necks to fancy bluegrass and jazz models. After selling his small company, in 1971 he started another, OME, which improved the instrument in design, construction and tone. He and his team (daughter Tanya is carrying on the family tradition with builders Rich Sharples, Gustavo Silva and Jose Prado) have made more than 6,000 banjos, with the quality of the designs expanding to include handmade models of every imaginable style. The “Parrot” bluegrass banjo also features the work of Colorado artisans: The wood carvings and inlay engravings are by Ron Chacey of Pagosa Springs and Kent Bailey of Florissant; the metal engraving is by Tim Gabriella of Marshall. Jon Eaton, a graduate of the Roberto-Venn School of Lutherie, opened Woodsong’s Lutherie in Boulder in 1981, running a one-man shop for the first ten years. To handle the demands of local and touring musicians, the staff of craftsmen has grown steadily to include Eaton, Mike Stephens, Matt Bergdorf, Greg Nichols, Ian Hendrick, Mike Davis and Jonathan Scott. 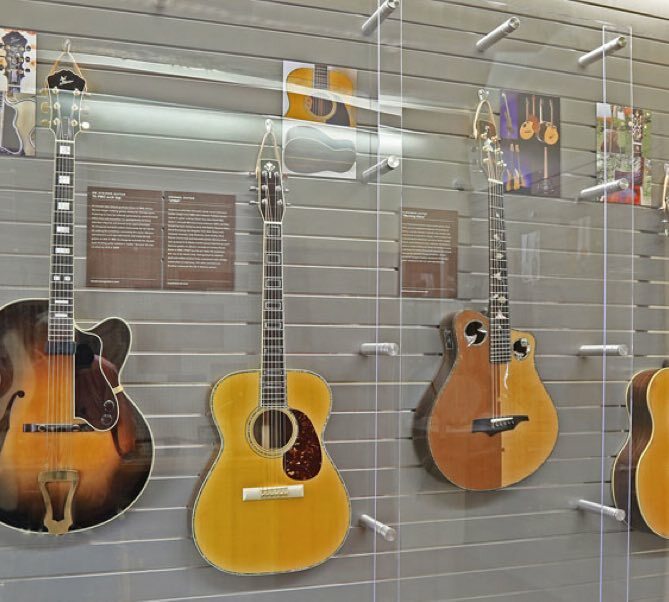 The team brings 97 years of combined experience to its trade and annually repairs an average of 5,000 instruments. Bonnie Carol learned to build dulcimers from her partner, Colorado luthier Max Krimmel. She created 328 instruments between 1972 and 2004, after which she collaborated on another 125 with Krimmel. Carol was one of the first to use Schaller geared tuners instead of the traditional friction pegs. Construction of each dulcimer is different, guided by a particular piece of wood as well as artistic and acoustic design considerations. An early Carol dulcimer, “#104,” has gone to the Smithsonian Institution American History Museum as part of the Ann Grimes dulcimer collection. 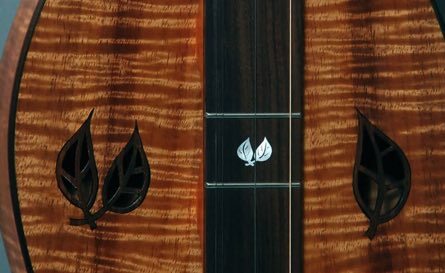 In 1999, Carol finished “#309,” which she constructed using curly koa wood from Hawaii and features rosewood bindings, engraved mother-of-pearl inlays in the fingerboard and rosewood leaf sound holes.